The city of Coppell, Texas has made a name for itself as one of the premier small cities in the nation. In 2015, Money Magazine named it the 8th “Best Place to Live.” Things like health, taxes, culture, and economy were all considered, and Coppell fit the bill! With its “Bold Vision, Big Impact” slogan, Coppell, continues to grow and thrive. Coppell was founded in the mid 1800’s and was named for George A. Coppell who assisted in organizing the railroad that went through the town. For most of its history, Coppell has been an agriculture based city raising crops like cotton, wheat, oats, sweet potatoes, peanuts, and melons. When the Dallas-Fort Worth International Airport opened in 1974, Coppell really began to grow its population and its economy. Today Coppell is an upper middle class suburb that sits next to the North East corner of the airport. New businesses are continually boosting the economy, and great recreational and cultural opportunities are drawing residents who love the benefits afforded them by living where there is a small town feel and plenty of big city amenities. The future looks bright for Coppell, but the city is not without its problems. Some of the difficulties faced by residents in Coppell are the same that people all over the South face: pests… and lots of them! The climate of Eastern Texas, with its hot, humid summers and mild winters, means that bugs and insects thrive here year round. One of the biggest pests disrupting the city of Coppell is mosquitoes. With the recent outbreaks of Zika and West Nile, the city is making a concerted effort to control the mosquito population and keep its residents safe. Texas also as the unfortunate opportunity to deal with plenty of spiders, including black widows and brown recluses. From dangerous spiders to nuisance pests like ants, bed bugs, and cockroaches, the residents of Texas just don’t seem to get a break. Luckily, Coppell residents have access to some great pest control. Vinx Pest Control wants to be your go-to company for all the things that are “bugging” you. At Vinx Pest Control, we are committed to using the best products that are long-lasting and safe, hiring only the best technicians, and offering the best guarantee in the industry. We are not happy unless you are 100% satisfied, and we will do what it takes to make that happen. We know that each area and home faces its own unique pest challenges, so we customize our treatments to meet each homeowners specific needs. 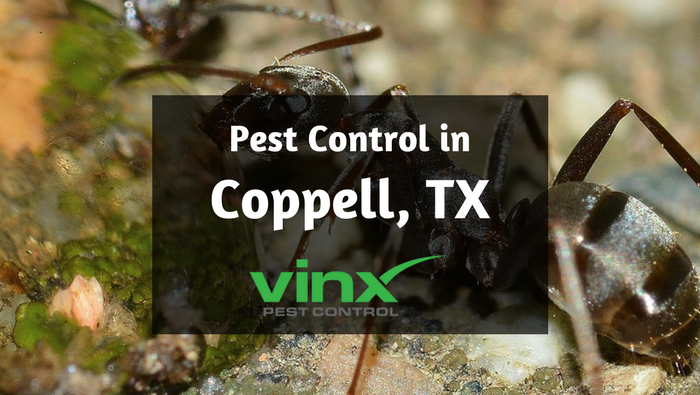 If you are in need of Coppell Pest Control, we hope that you will give us the opportunity to earn your business and your trust.